Whew! No pressure – this is just the obligatory, inescapable, First Post. Who doesn’t flip back to the first post of a blog to see the beginning? I am totally guilty of that and it always seems to be worth it. To see a blog that has been around for years, has adapted and improved and expanded and to be able to look at where it came from – always satisfying. So, here we are. My first post. On my first day so law school orientation (yes, yes… I may be guilty of being an attorney – please don’t leave! Come back!) the Dean had us write down our hopes and dreams of where we would be after a grueling 3 year – intensive education during which, they foreshadowed the high likelihood that the two people sitting next to us would most likely get divorced. Applying that little exercise here, to “future me” in 3, 5, 8 years… It is my hope that this website not only allowed you to follow your dreams and your passions, but I also hope it allows other people to get inspired, get creative and see the beauty of food. How many times in the last week, month have you, yes YOU, actually sat down and enjoyed a meal. 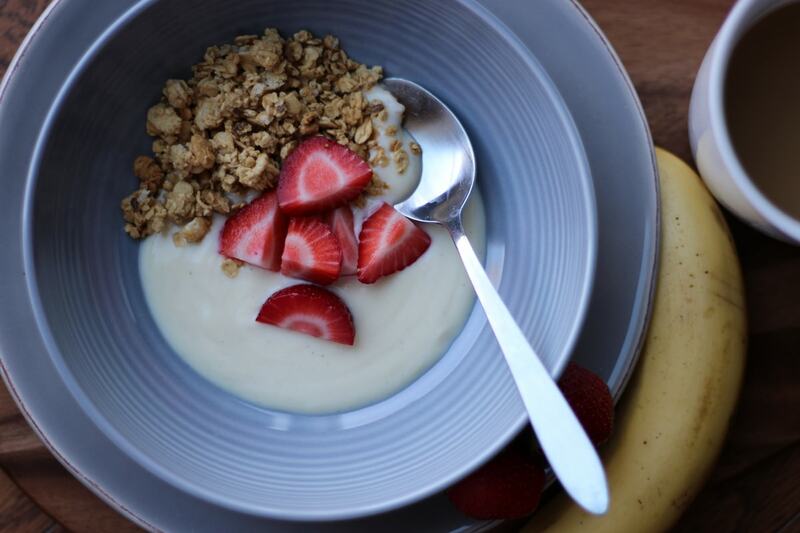 It doesn’t have to be Julia Child’s beef bourguignon, but as simple as this soy yogurt, granola and strawberries. The art of putting together a beautiful plate of food, even if it is just a simple breakfast that you are eating by yourself on a Saturday morning. Why can’t we take the extra time and make it beautiful. Why can’t we take a bite and really savor the combination of crunchy and smooth, yet sweet and maybe tart. Instead, we inhale our food as our child cries and our husband needs to mow the lawn before it gets dark (do I sound like I am speaking from experience – because I am) – and we will all continue to have those moments, probably a lot. But maybe, just maybe, once in a while you can sit down and create something beautiful with your food and actually savor it. That is what I am passionate about and that is what I want to share with all of you. That, in combination with experimenting with creative recipes and and awe-inspiring food photography. The last piece of my culinary puzzle is to explore and expand upon the ever-so-popular “farm-to-table” movement, which I hope never loses momentum. We should be asking where our food comes from and what is what I am eating, eating (yes, you read that right – in other words: I am eating beef for dinner….what did this cow eat before I ate it?). These are important questions and I am going to exploit my science teacher of a husband A LOT through the process in order to find out the answers. Anyway, those are my culinary musings for the day in my creative space that is The Wooden Skillet. I am beyond, beyond, beyond excited to be here with the ability to be creative and learn with all of you. 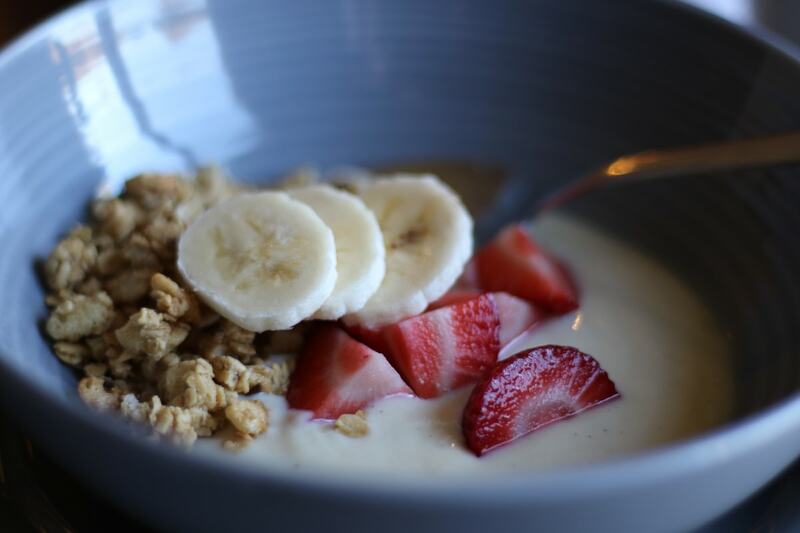 Pour yogurt into beautiful bowl; Pour granola on top and sprinkle with strawberries. Garnish with banana slivers. Savor.